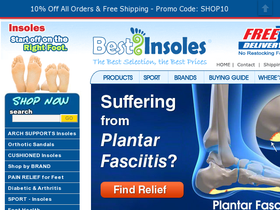 Shop Best Insoles online at BestInsoles.com for the complete Spenco Line of arch supports and insoles, as well as Superfeet Insoles, Lynco Insoles, SOF Sole Insoles, Powerstep Arch Supports, Sole Insoles & Orthopedic Sandals as well as other brands. Best Insoles carries Podiatrist recommended, Spenco Insoles, Arch Supports and Orthotics which give your feet the right support they need to make you feel light on your feet again. Save on your next purchase from BestInsoles.com with Best Insoles discounts, Best Insoles coupons and Best Insoles savings from 58coupons.com. BestInsoles.com is offering 10% off all items for a limited time. Click link to view code. Save 5% store wide at BestInsoles.com. Click code to view. Best Insoles is having a 20% - 40% off sale for a limited time only. Click link to start saving.